The Update Action is by far the most used of the many action options. Use this type of action allows list fields to be treated as variables for each record. In this way, functionality can be programmed based on user or system updates to the list record. In this example, we'll change the information presented to the user based on a status field. Set the field as read only in the user interface. Show the field on the first tab of the user interface. Create and Update Action to change the value of Project Requirements based on the user Category selection. Use a condition to trigger the update only when the user chooses Sales for Category. Use the "ID = [ID]" rule to ensure that the update occurs only for the current record. 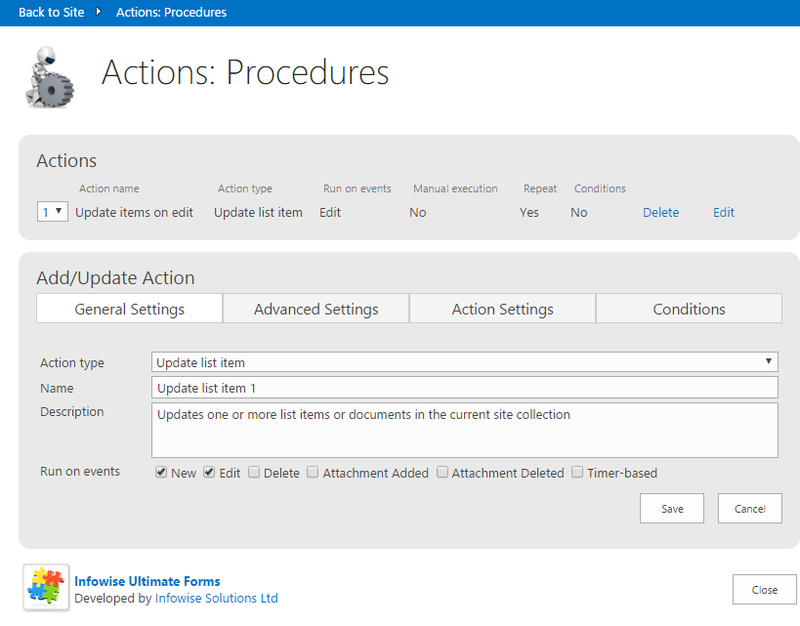 Update actions are used in many different ways in Infowise projects. This is the most common and the most versatile of actions. Combine and chain together multiple update actions to create an interactive and dynamic project tool.